Job Description: The Adult Therapist is responsible for providing evidenced based, therapeutic treatment to English/Spanish speaking adolescent and adult survivors of childhood sexual abuse and/ or sexual assault to include individual, group therapy, and crisis interventions. The following is not an exhaustive list of responsibilities. This list of essential duties and responsibilities is intended to provide a representative summary of the major duties and responsibilities performed. Incumbents may be required to perform other job- related tasks other than those specifically presented in this job description. Provide individual, group counseling, and crisis interventions to English/Spanish speaking adolescent and adult survivors of childhood sexual abuse and sexual assault as needed. Responsible for appropriate documentation to include case notes, outcome measurements, correspondence, internal reports, grant reports, and general maintenance of records. Participate in agency staff meetings, fund raisers and other activities as assigned. Enhance professional growth and development through activities such as professional affiliations, conferences, workshops, etc. Perform other duties as assigned and/ or requested. Job Specific Knowledge, Skills, and Experience: Masters degree in counseling, or related field, and licensed in the state of South Carolina; preferred three years post master’s experience in working with survivors of sexual assault and childhood sexual abuse or other trauma related field; must have excellent communication skills, problem solving skills, and interpersonal relationship skills; preferred bi-lingual in Spanish. 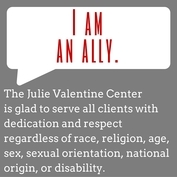 ​Interested applicants should email a cover letter and resume to Amie Snell at asnell@julievalentinecenter.org. ​Job Description: The Adult Therapist is responsible for providing evidenced based, therapeutic treatment to English speaking adolescent and adult survivors of childhood sexual abuse and/ or sexual assault to include individual, group therapy, and crisis interventions. Provide individual, group counseling, and crisis interventions to English speaking adolescent and adult survivors of childhood sexual abuse and sexual assault as needed. Description: The MUSCLE Program facilitator is responsible for planning and implementing MUSCLE, a primary prevention program traditionally facilitated by men, for boys ranging from 8-15 years old. This program is taught in summer community center day camp programs, in both private and public schools during school hours, and after school programs.This position is part time. Hours vary based on scheduled programming. MUSCLE is a 6 session program. Facilitators must be able to commit to teaching all six sessions in a program. This is a contract position. This list of essential duties and responsibilities is intended to provide a representative summary of the major duties and responsibilities performed. Incumbents may be required to perform other job- related tasks other than those specifically presented in this job description. Provide educational programs that are evidence based and developmentally appropriate for boys primarily aged in the middle school grades including in-school programming as well as after school programming. Provide and facilitate evidence based programming for gender specific summer programming in community centers in the Greenville county area. Network with community partners to maintain and develop collaborative partnerships as well as market the Education Program in the community to build connections and programming. Background checks are required with both SCDSS and SLED. Successfully complete mandatory 10 hour training course to learn curriculum and how to implement it. Specific Knowledge, Skills, and Experience: Experience and training in working with children; experience in public speaking and/ or training; ability to remain calm in crisis situations; ability to work independently at organizing and planning programs in the community; must have reliable transportation. Interested applicants should email a cover letter and resume to Amie Snell at asnell@julievalentinecenter.org.